Littelfuse offers Ring Lug probe housings suitable for a wide range of temperature sensing applications. If the dimensions on this product won't work for your requirements, please contact us for further assistance. Important Note: The product shown is a probe housing only. The temperature sensing element needs to be selected along with other physical properties (lead wire type, termination, etc.). 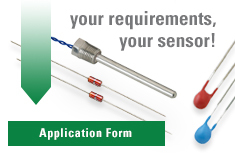 Please fill in as much information as possible about your unique temperature sensor requirement using our application form and someone from our engineering team will contact you.